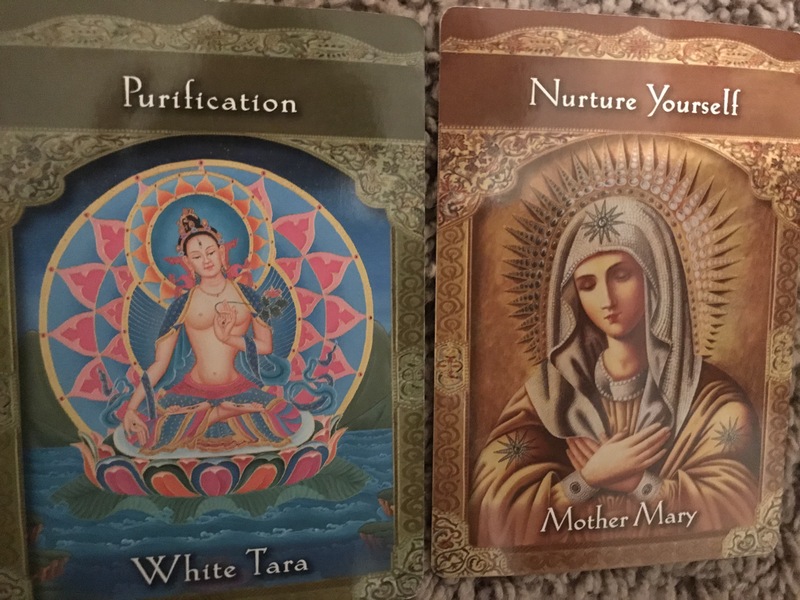 2 cards reminding us that self love will be a core value in our progress. The week ahead is going to be a test. If you’ve been feeling stuck in a loop of self sabotage, whether you like it or not you’ll be changing long term destructive patterns. The divine refers to habits we’re trying to break. Everything we do is in pursuit of pleasure or avoidance of pain. By pin pointing the source of pain that started the bad habit and expressing compassion towards the part of yourself that is wounded, you can more easily and successfully reset your behavior. Often times, belief systems that we develop around childhood traumas shape our behavior in a way that we’ve decided aids our survival. For example, if your father drank and your Saturday morning cartoons upset him when he was hungover and lead to abuse, you may associate a negative perspective against cartoons. Cartoons aren’t necessarily hurtful, but your mind as a child only sees the pain caused by watching them and now you feel guilty and unworthy in association. Perhaps you now don’t allow your children to watch cartoons based on a false belief system or your favorite childhood tv show triggers depressive episodes. For some it stops at negative emotions, but for many the inability to heal these negative emotions manifests as addictions or other forms of self harm. By isolating the root experience leading to our emotional trauma, and showing compassion to ourselves afterwards, we can finally heal. The energy is ripe for this deep healing this week. Be gentle on yourself this week. If you enjoy reading my blog and would like to help me keep it going, here’s a couple of ways to support me. If you’re a lover of the great outdoors, Make a purchase on Madera Outdoor using my promo code! You can donate to me directly here! Or you just keep reading! Subscribe below!